The two fastest things on the planet are a motorcycle and a banjo. We don't have a motorcycle. Hard-core banjo, blues harmonica, and a driving rhythm section are what create the explosive 50 Sticks sound. A band is said to be a sum of its parts...if you were to remove Ian McFadyen from the equation you'd probably be left with less than a dozen sticks of Dynamite...Ian writes and sings most of the bands repertoire and his 6'2" suit and tie clad "Mr. Clean" persona is impossible to ignore as he powerfully unleashes an electric wall of sound from his amplified 5 string banjo complete with double cut-away black horns. In forming the band, Ian recruited friend and mythical musician Whitey Wingland to be his wingman on guitar and harmonica, met bassist Michael Dominguez via a mutual friend, and when their original drummer skipped town...Chris Jensen eagerly accepted the invitation to become 50's regular drummer. The band is definitely building it's following of those who can't seem to get enough. It's interesting to see 50 Sticks fans come into the room cool, calm and collected only to leave at the end of the night drenched in their own sweat, a little hoarse from hollering and with authentic smiles from ear to ear...they kind of look like they've had a huge blast. Expect to hear 50 Sticks of Dynamite blow the roof off a place near you soon...better yet…be there when they detonate next! 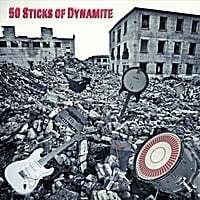 "50 Sticks of Dynamite" Reviewed by RadioIndy.com! The two fastest things on the planet are a motorcycle and a banjo. We don't have a motorcycle. Hard-core banjo, blues harmonica, and a driving rhythm section explode across this rootsy blues rock compilation of lust and heartbreak.